One of the most fun things I learned after discovering Fat Free Vegan Kitchen nearly 7 years ago now was the custom of eating black-eyed peas and greens at New Year’s time for good luck in the coming year. If you haven’t had your black-eyed peas yet and are wondering how to fix them, here’s Susan’s compendium of favorite FFVK black-eyed peas and greens recipes, Black-Eyed Peas and Greens for a Healthy New Year. Two of my favorites are among the Asian style recipes: Black-eyed Pea Masala and Koreans Black-eyed Peas and Kale Bowl. When I made the Korean Inspired Black-eyed Peas and Kale Bowl a couple of winters ago on my Tuesday night dinners with my friend Clark, I knew he likes things a lot more spicy than I usually do, so I bought a bottle of the Korean red pepper paste Susan talks about in her post, known as gochuchang, or kochuchang or gojuchang. Susan has a recipe for a mildly spicy sauce at the end of her recipe that calls for a very little of this traditional paste, and I knew Clark would want extra. It wasn’t until later that I realized it also had wheat starch and soy in it, and so shouldn’t be something I ought to eat on an regular basis (makes my nose run). Alas, I had fallen in love with the smoky taste of it and Korean flavoring in general, so I ordered a bag of Korean red pepper on Amazon that will probably last me the rest of my life, and searched internet for a gluten free alternative recipe. I found one that contained a whole cup of miso (to provide the fermentation a traditional recipe would require) and, well, it just wasn’t quite right to me. Meanwhile, I had also tried making a soy free version of this Vegan Korean Mushrooms and Tofu Stew at Spice Island. There is a recipe within the recipe for a seasoning paste for the stew that I decided to adapt into an oil-free approximation of gochuchang. 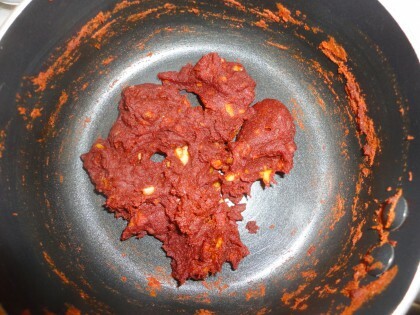 I don’t claim that it’s authentic, but if you follow the cooking directions to cook the paste for about 10 minutes, stirring it all the while, you will end up with an amazingly delicious spicy paste to add to millet, stir fried veggies, and your new year’s serving of black-eyed peas. My adaptation will keep well in a glass jar in the fridge for at least a week, probably longer. Start with 2 tbs of the broth and get it warm to simmering in a small sauce pan or six inch frying pan (non-stick is nice but not necessary as long as you are paying attention). When the broth starts to simmer, add everything else and whisk with a small whisk or a fork and spatula. Keep stirring and cooking for 10 minutes. If it seems too dry, add the extra tbs of bean or mushroom broth. It should have the consistency of tomato paste. When it’s done, which is, miraculously, in about ten minutes, you’ll know because it darkens and smells wonderful and tastes, well, done. Stir a spoonful (or two, if you dare) into your warm grain, beans and greens, sweet potato, or whatever else you would like to give a Korean style kick in the seasoning pants to. 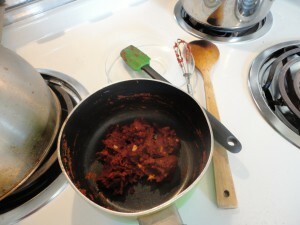 Or use it as a gochuchang substitute in Susan’s simple spicy sauce. If you absolutely can’t find Korean red pepper, you could try this with smoked paprika, but it won’t be have that Korean flair. There’s something about that red pepper that just can’t be duplicated. If you’d like it more saucy than paste-like, whisk in some more broth after cooking. In the original recipe, all the paste goes into the stew pot. May your new year be spicy in all the best ways! 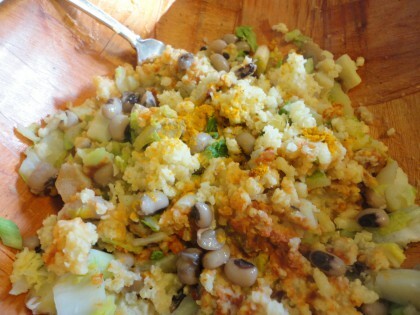 We’ve been eating black eyed peas the last few days, as Darren couldn’t find the black beans he was craving! Your red pepper paste sounds great! I love gojuchang! I did find one that didn’t have wheat in it, but not one without soy. I never thought of making my own; and I do have a big bag of that Korean red pepper (the same one you pointed to) that I got for making my own kimchi. Of course it can be used for homemade pepper paste. 🙂 Thanks for sharing!